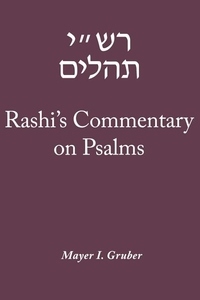 In 2004, Mayer Gruber's landmark Rashi's Commentary on Psalms made one of the 11th-century scholar's most important works accessible to a larger audience for the first time. The JPS paperback edition of this exceptional volume includes the complete original Hebrew text and acclaimed linguist Mayer Gruber's contemporary English translation and supercommentary. Fully annotated by Gruber, Rashi's Commentary on Psalms places Rashi, the most influential Hebrew biblical commentator of all time, in the larger context of biblical exegesis. Gruber identifies Rashi's sources, pinpoints the exegetical questions to which Rashi responds, defines the nuances of Rashi's terminology, and guides the reader to use the English translation as a tool to access the original Hebrew text. Gruber's extensive introduction takes a critical look at Rashi and his enduring legacy.